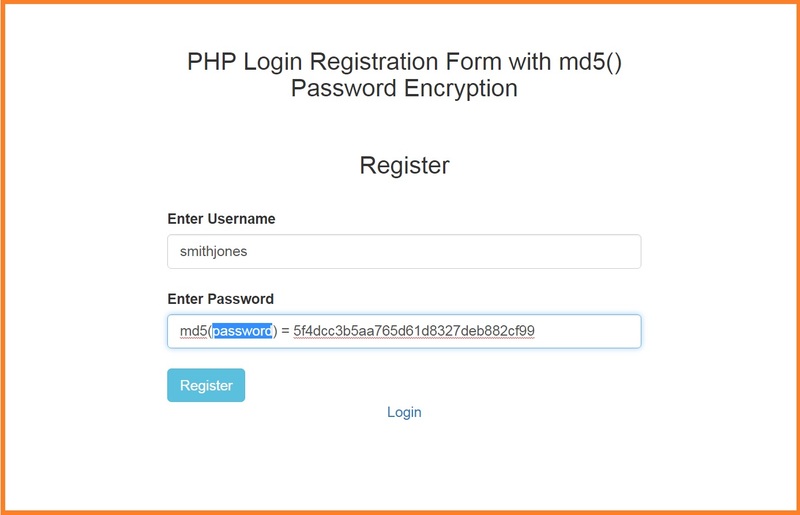 Hello friends in this tutorial we are going to discuss simple php login registration system with password encryption method by using php md5() built in function. This is very simple php code but most effective because in this we have not store password in string format but we have encrypt password and then after we have store password into our database. So no one can hack password because it was encrypt by using md5() php function. In most of the php application there is login is the one part of any web application. And No one can access the web application without login. So For login he can enter it's password for log into web application. If we have store password in simple string format then any one can hack password but if we have store password in encrypt format then no one can hack password. So this things we have discuss here, here we have show how to encrypt password and store into our web application and we have also show we can validate encrypted password. This all things we will discuss here. Here when new user register to this system then at that time password has been encrypted by using md5() function. This function will encrypt user password and store that encrypted password in database and when user come for login then user enter his password and when system validate user information then at that time also password has been encrypt and validate user information by using that encrypted password, this is because in database table we have already inserted encrypted password. This for prevent from password hacking.